Let’s face it: life is busy today. In a world where social media is more popular than ever, we can often forget the importance of being face-to-face with others from our community. We can come up with many excuses not to attend the Nutritional Therapy Association’s Annual Conference – we don’t have the time, we don’t want to travel, it’s cost prohibitive. But the experience of attending the conference provides learning and career-building opportunities that you just won’t find anywhere else. In-person contact with people who are active in our line of work can not only help us feel more connected, it can also help us uncover new ways to grow our business and to gain and share knowledge from people we don’t normally have access to. The NTA Annual Conference in March 2019, Roots, is going to be bigger and better than ever before. Not only are we in a new, beautiful venue in the heart of Portland, we’ve been listening closely and implementing the feedback attendees have shared with us from previous conferences in order to make Roots our best annual conference yet. While there is so much information out there for us to consume – from social media, articles, blog posts, books, studies and more, nothing compares to the educational aspect of a conference. The NTA sources some of the smartest, most respected, and knowledgeable experts in the industry to talk about subjects that are relevant and important to our own lives, the lives of the clients we work with, and to the health of our businesses. Opportunities to meet the people that you look up to most in the health and wellness world don’t often come up. Maybe you’d like to take a selfie with an NTP who’s influenced you, share a business idea with one of the experts in our lineup, or make a connection that can lead you to finding your mentor. Functional medicine expert and best-selling author Chris Kresser, Founder of EPIC Provisions Katie Forrest, and Yuri Elkaim, business coach to health entrepreneurs (and more!) will all be speaking at the Roots conference. It isn’t possible to meet them unless you are given the opportunity to be in the same room and this chance doesn’t come up when you are listening to their podcasts or participating in an online summit. While social media associates many of us, it has its limits. There is nothing like meeting and connecting with others in person. Conferences provide a great networking opportunity and the perfect environment for fostering relationships. The NTA Annual Conference offers the chance to mingle with colleagues, speakers, and vendors, to form new relationships, and to strengthen those that previously exist. Meeting community members from other areas can be a valuable opportunity for sharing best practices, creating a referral network, and generating inspiration. There will be many opportunities throughout the conference to grab a cup of tea, broth, or a meal with others near our new venue in beautiful Portland. Most of us don’t take the time to step back and attend conferences very often. But by spending a few days away from your actual “work” to immerse yourself in a conference like Roots, you sharpen your skills as a practitioner and a business owner and return with new ideas and fresh approaches to make you more efficient and effective in your work. As we know, a dull axe won’t cut down a tree nearly as effectively as a sharp one! Our new venue in downtown Portland is the perfect place to come together and learn. We carefully select each exhibitor that joins us for our annual conference and receive wonderful feedback from our attendees about the companies and vendors they see in our exhibit hall. The annual conference is a great time to mingle with sponsors, vendors, and exhibitors by trying out their products and services, taking home samples, or purchasing products for yourself and your business. We find innovative companies with the highest integrity and quality in the industry to partner with for our conferences. The contacts you make are often some of the best people to speak to if you want to learn more about the current climate in our industry. Plus, discovering innovative products and services for your business is a highly valuable way to stay competitive and current in your own practice. We’ll have some new and exciting companies joining us for Roots in March including safe cleaning products company, Branch Basics, innovative food company Epic Provisions, as well as classic favorites like Heart2Heart Farms. When you are active in your industry and continue to put yourself out there with your peers and colleagues, you are better able to develop a reputation as an expert to your peers and your clients. Those who are engaged are more often asked to speak at events, write articles for their industry publications, and build broader referral networks. Clients also tend to feel good about doing business with those that are celebrated or admired by their peers. When you attend a conference you are providing yourself with an opportunity to see and be seen yourself. Come to the annual to not only expand your own knowledge but to propel your reputation and business forward too. It’s easy to read a blog post, listen to a podcast, or watch a video or documentary from the privacy of your home or office, but attending a live event forces you to break out of your comfort zone and experience a more immersive learning environment. While some are born networkers, for many, attending a live event and interacting with other people can be a challenge. Breaking out of our comfort zones is often just what we need to change the ways of thinking that keep us in the ruts we tend to fall into in our businesses and lives. The beauty of coming to a conference like this is that everyone shares like-minded philosophies, values, and affection for good food. There’s no better feeling than spending time with “your people.” You will see your former instructors, your mentors, people who were in your classes, those you met at previous NTA events, and maybe even meet a new friend, mentor or colleague. You will not only walk away from the conference with new knowledge but also lasting relationships and connections for life. Take advantage of all that Portland has to offer with your community– eat at amazing restaurants, drink the best organic coffee of your life, try a workout class, go for a hike, visit the beautiful parks, picturesque riverfront and much, much more! Leaving your practice or work for a few days, learning more about your profession, and experiencing the weekend with your community is an investment in yourself, the people you help, and your own business. When you buy your conference ticket and show up to the Hilton in Portland, you are investing in your own growth and your own worth. You will walk away after the conference weekend re-energized and ready to take on your own business with a fresh perspective. Being in business should be rewarding and fun. Our work can be challenging and we deserve to take time for ourselves. Besides, we all know how “all work and no play” can impact our health! Attending a conference with your community can bring empowerment and joy by mixing a social aspect into your learning and business development. The conference itself will provide lots of fun, including banquet dinners featuring healthy local and seasonal foods, lots of socializing, and of course, a dance party! You can even treat your time away from home as a getaway or mini-vacation. Arrive a day early or stay an extra day or two to have some fun and take in all that Portland has to offer. Enjoy the city’s delicious, allergy-friendly food, get lost inside the famous Powell’s City of Books, walk through Portland’s beautiful parks (we recommend checking out the Lan Su Chinese Garden, the Portland Japanese Garden, and the International Rose Test Garden), visit the internationally renowned Portland Art Museum, or admire the breathtaking views of the city from the historic Pittock Mansion. 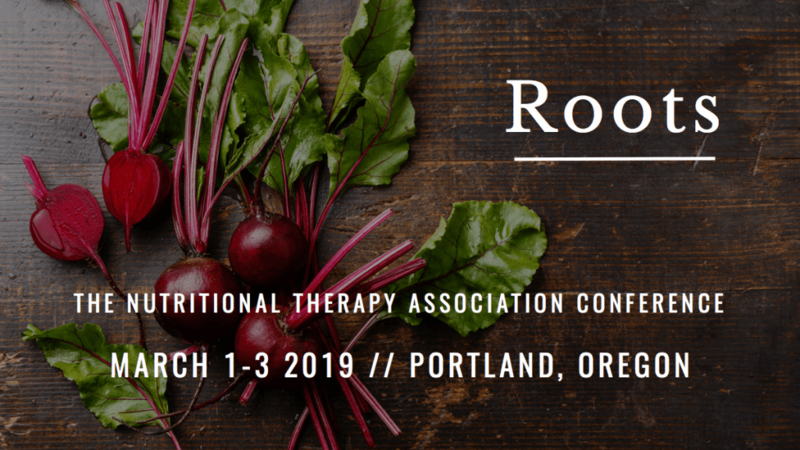 The NTA will hold its 12th Annual Conference, Roots, on March 1-3, 2019 in Portland, Oregon. It’s going to be our best annual conference yet! The conference will bring together experts across diverse fields dive deep into the root causes of systemic health problems, investigate how we can grow strong roots in our food delivery system, and provide an opportunity for you to grow roots with the NTA community. The conference is 3+ days, complete with keynote speakers, breakout sessions, networking opportunities, and banquets. Attendees have the opportunity to earn Continuing Education Units by attending all three days of the conference or by purchasing conference recordings.